LOCATION: 258 St. Nicholas Ave.
“Spirit of Community: Artists of East Harlem is a collection of works by local artists who convey the ups and downs of life in their diverse community through various colors, textures, and rhythms. This exhibit is part of Community Works Harlem isART rotating exhibition series, which features work by artists from both local and outside communities. Mon. Fri. 10 a.m. – 5 p.m., Sat. 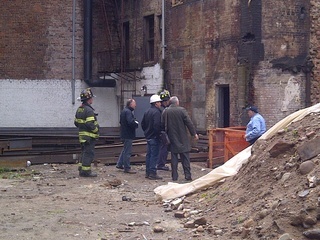 1 p.m. 5 p.m.
HARLEM A small wall collapsed inside of a building under construction on East 125th Street, officials said. The 10-foot-high brick wall inside of 51 E. 125th St. Came down just before 8:30 a.m., an FDNY spokesman said. No one was injured in the collapse, the spokesman added. The building was empty because of the heavy rains over the weekend, said Martin Shkreli, the contractor for Alba Group. Shkreli speculated that the wall came down because of the downpour. A gunman who killed a teenage girl and wounded an older woman survived a shootout with cops in Harlem Tuesday morning, police said.